In the last few years I’ve discovered that I have a taste for sake. I’ve learned the basics about how it’s made and the different types available, but haven’t sampled enough to get a handle on my preferences. There’s a very distinctive taste that most sakes have in common, despite their many differences and it’s a taste I like very much. But having one or two sakes in isolation once every few months serves only to let me choose my favourite between the two – such tastings are too few and far between for me to build up a coherent library of taste memories in my head, and thereby gain more confidence on choosing well in the future. One of the outstanding items on my Food & Drink To Do list is to immerse myself more fully in the world of sake and work out which styles, regions and even producers I love the most. 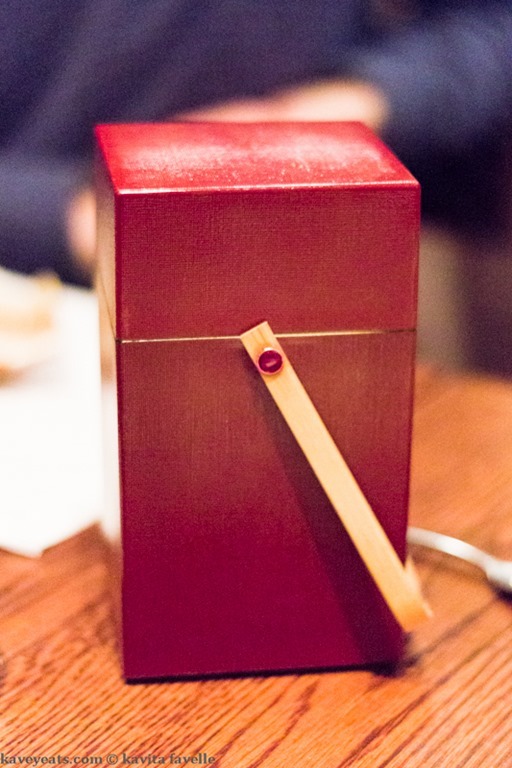 The Chisou restaurant group have been running a Sake Club for about a year now, a regular evening of tutored tastings with matched Japanese snacks provided. I’ve been meaning to attend since they launched, but have singularly failed. What finally spurred me to action was actually a deviation from the norm – a special umeshu tasting. 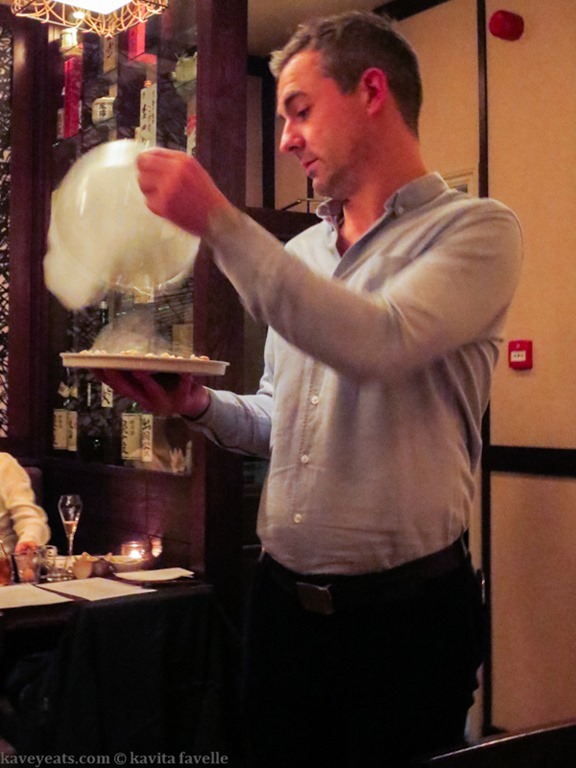 The tastings are held in a private room – in Chisou Knightsbridge this was the upstairs dining room – properly separated from regular diners. 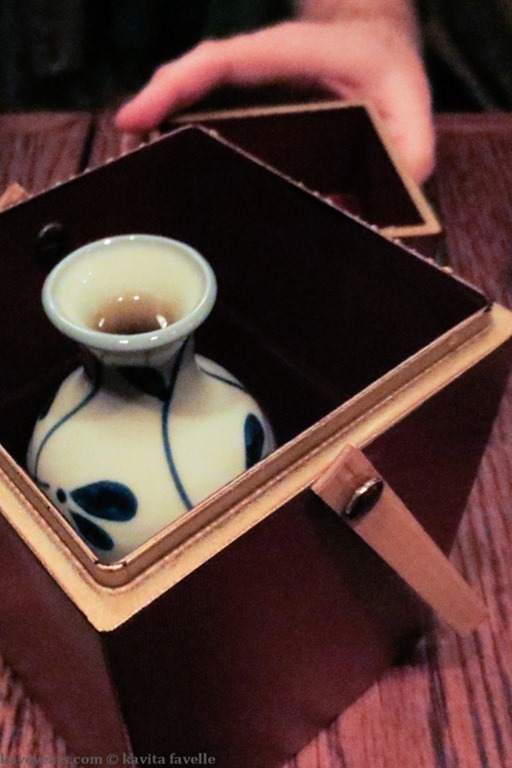 We shared a table with a couple who were also first timers to the Sake Club, Gareth and Nirvana, and had a lot of fun talking about food and drink, life in London and visiting Japan. Chisou’s Marketing Manager Mark McCafferty hosted the evening and started by giving us an introduction to umeshu, though a printed crib sheet was also provided for each guest. He introduced each of the six drinks, and the snacks that were served with them, sharing tasting tips and notes throughout. 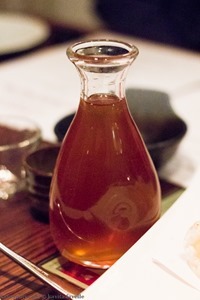 Although umeshu is usually described in English as plum wine, the ume fruit is not actually a plum; although nicknames include both Chinese Plum and Japanese Apricot, it’s a distinct species within the Prunus genus (which also includes plums and apricots); if a comparison is still needed, the ume is a stone fruit that is closer to the apricot than to the plum. Why did Chisou decide to hold an umeshu night as part of their Sake Club series? Because umeshu is traditionally made using surplus sake or shōchū – a distilled spirit made from a variety of different carbohydrates – or to use up batches which have not turned out quite as planned. That said, as it’s popularity has increased, many breweries make umeshu as part of their standard product range, and some use high grade sake or shōchū and top quality ume fruit to do so. The method is very straightforward and will be familiar to those who’ve made sloe gin or other fruit-based spirits – strawberry vodka, anyone? Whole ume fruit are steeped in alcohol – the longer the period, the more the fruit breaks down and its flavour leaches into the alcohol. Some umeshu is left to mature for years, allowing the almond-flavour of the stone to become more pronounced. In many cases, additional sugar is added to the umeshu, to create a sweeter liqueur. Many households make their own umeshu when the ume fruit is in season, as it’s a very simple drink to make. 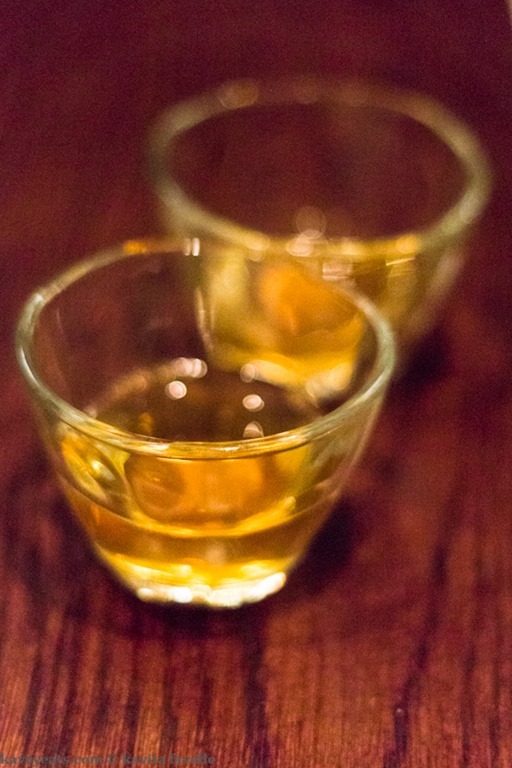 The whole fruits are often left in the umeshu – both in home made and commercial versions – and served alongside the drink. Take care, as the stone is still inside! The welcome drink, as everyone settled in and we waited for a few late arrivals, was a Kir-style cocktail of prosecco and Hannari Kyo umeshu. With this we enjoyed orange-salted edamame beans and wasabi peas. 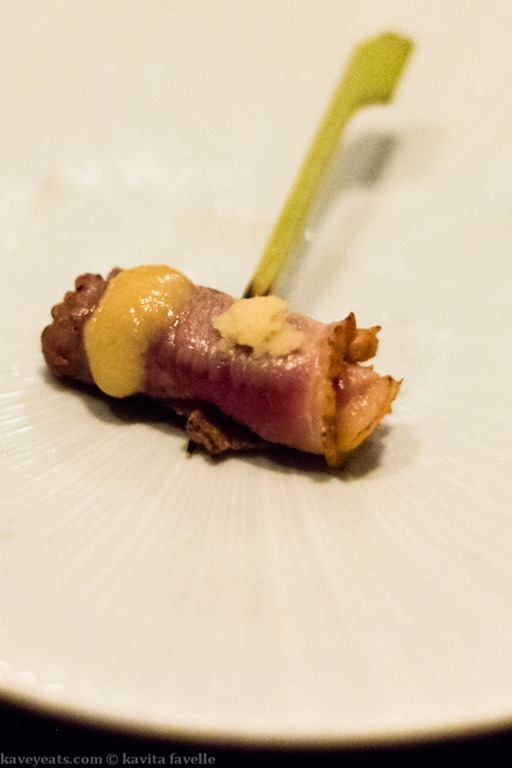 Next, an Ozeki umeshu on the rocks served with a generous plate of pork scratchings with individual bowls of an umami-explosion shiitake mayonnaise. In Japan, the highest quality of fruit is often very expensive, and Mark explained that this particular brewery use top quality ume for their umeshu. For Pete, this was “reminiscent of a sherry” and Nirvana liked the “aftertaste of almond”. 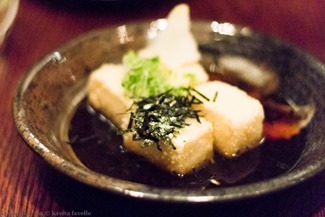 I loved this umeshu, one of my favourites of the evening. Third was a cloudy version – Morikawa umeshu – made with a ginjo sake (using highly polished rice), so quite unusual. For me, this tasted stronger than the previous one, but in fact it was a slightly lower ABV – I think this may simply have been because more bitterness was evident in the taste. 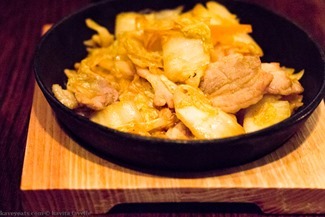 Mark suggested we should “warm it up like a mulled wine, to make the most of it’s spiciness”. Gareth particularly enjoyed the “mouthfeel” of this umeshu. Pete thought it would an amazing match with a cheese – a perfect replacement for port. 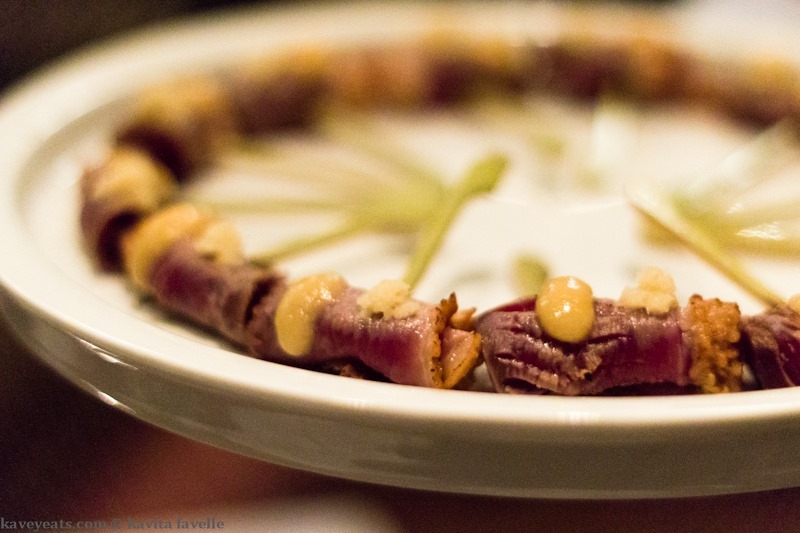 With this came a small skewer of smoked duck with apple cider, miso and fresh ginger, served theatrically beneath a smoke-filled dome. I could have eaten an entire plate of these, instead of just one! I was surprised how much I liked the fourth option, as I couldn’t imagine the combination on first reading the menu. The Tomio Uji Gyokuro umeshu combines traditional shade-grown green tea with umeshu to add a rich umami note to the finished product. Oxidisation means the drink is amber rather than green, but the meaty and medicinal notes are evidence of the presence of green tea. 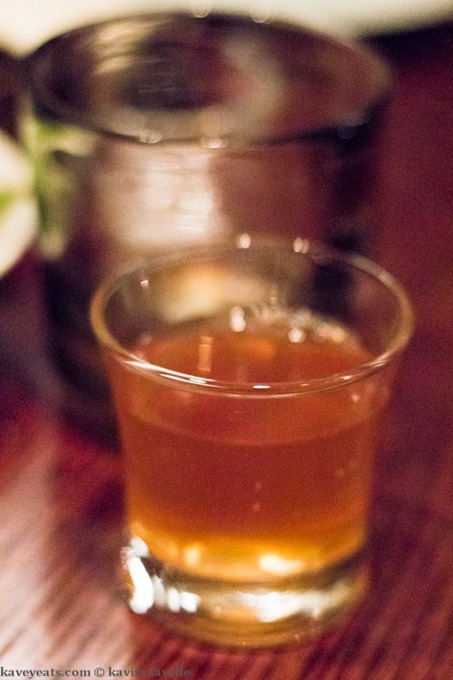 Next was a cocktail combining Hannari Kyo umeshu with Yamagata Masamune sake, lime juice and angostura bitters. I found this a too bitter and dry for my tastes, so asked if I could taste the Hannari Kyo umeshu on its own, as we’d only tried it with mixers thus far. It’s a lovely umeshu but couldn’t compete with the Ozeki umeshu or the Tomio Uji Gyokuro umeshu for me. 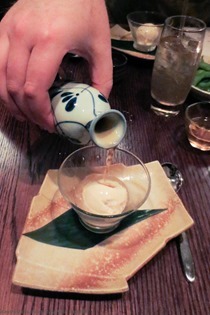 Last, we were served a cup of good quality vanilla ice cream with warm Morikawa umeshu to pour over the top, affogato-style. As you’d imagine, the sweet and sour notes of the fruit liqueur really work well with cold vanilla ice cream, making it what Nirvana called “a very grown up ice cream”. As Mark commented, “warm it up and it really comes alive”. Pete and I decided to stay on and order a few dishes from the food menu to soak up the alcohol before heading home, umeshu-happy. After such a great evening, we are keen to attend more Sake Club events. Umeshu night was very well priced at £40 per person and was a great learning experience, a fun social evening and very delicious. 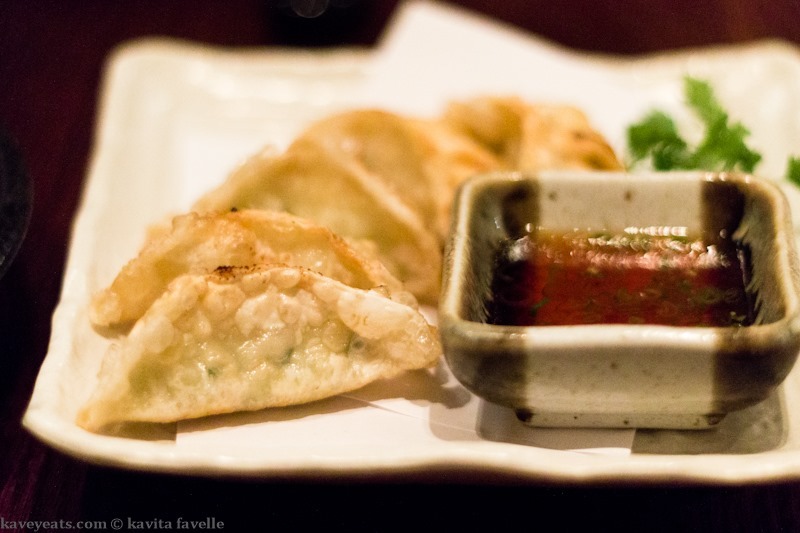 If you book Sake Club, do take care that you go the right location. The club is alternately held at different branches of the restaurant and it’s not uncommon for regulars to go to the wrong one, resulting in a mad dash across town. 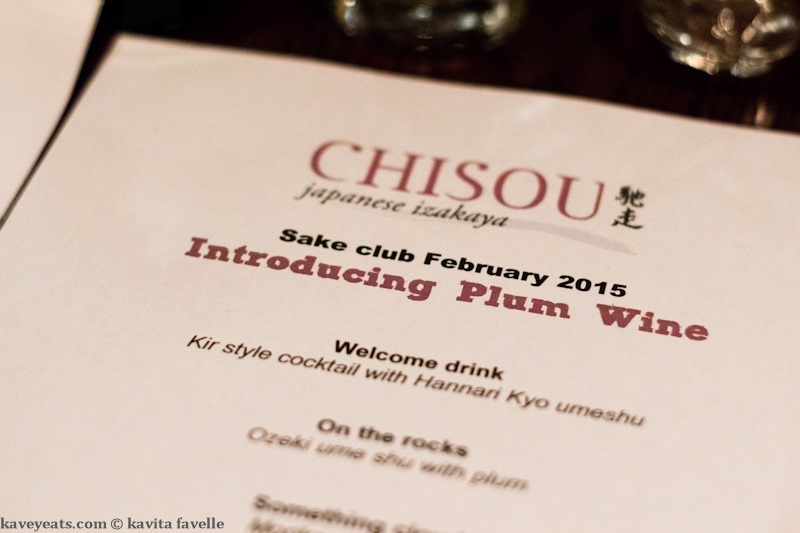 Kavey Eats attended the Umeshu tasting as guests of Chisou Knightsbridge. The additional dishes pictured at the end were on our own tab. 14 Comments to "Umeshu Night at Chisou’s Sake Club"
I love Japanese plum wine and just how unique the flavour is. 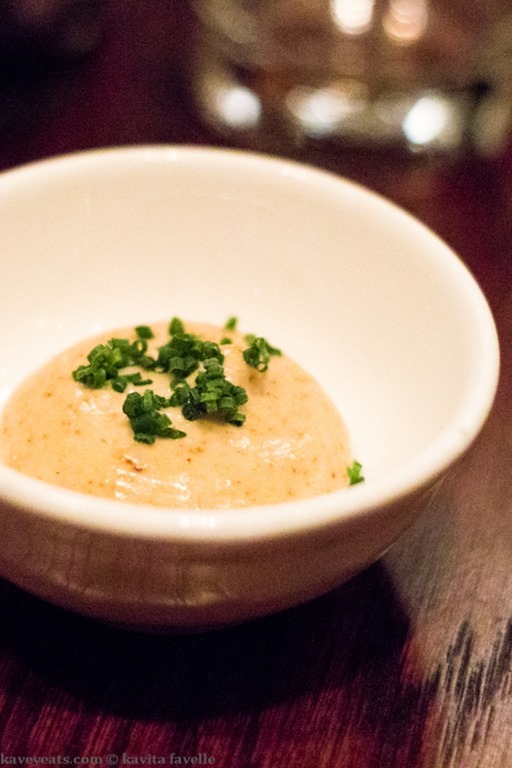 The sweet sour notes are delicious and I would love to try it out affogato style – now that I have never seen before! As I’m not a fan of wine or beer, I often focus on sweeter liqueurs, and this one is a firm favourite of mine. Many are so good over ice cream — amaretto, tia maria, pedro ximinez sherry, and of course umeshu! This looks like somewhere my husband would love to go. Everything looks so delicious. It’s a fun place. The menu has changed a lot since I visited last a couple of years ago, different chef now. How interesting! 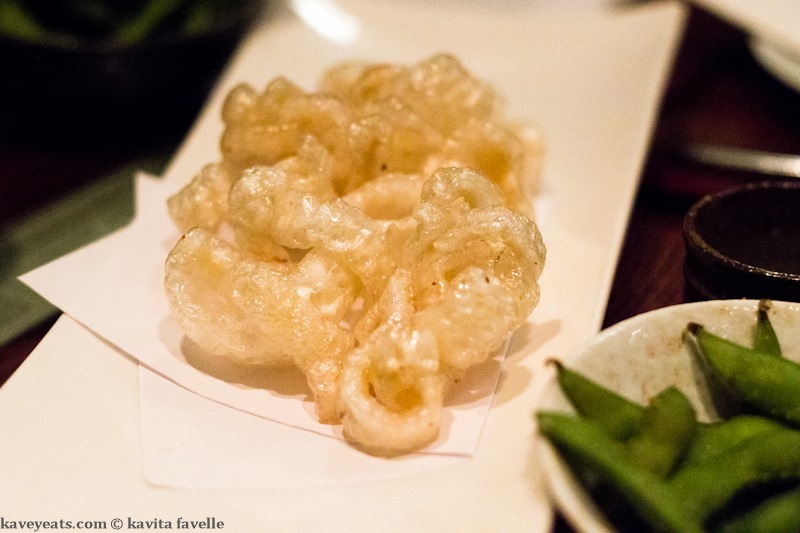 I think pork scratchings and shiitake mayo should be on bar menus everywhere – they sound amazing! Honestly, was such a fabulous snack, just as well i can’t get hold of it every day! Sounds like a fabulous evening Kavey. I love how you have a ‘Food & Drink To Do list.’ Note to self – must create one of these. Out of interest what else is on your list? Corin, it’s a mental list, I’ll share with you, I need to write it down!!! 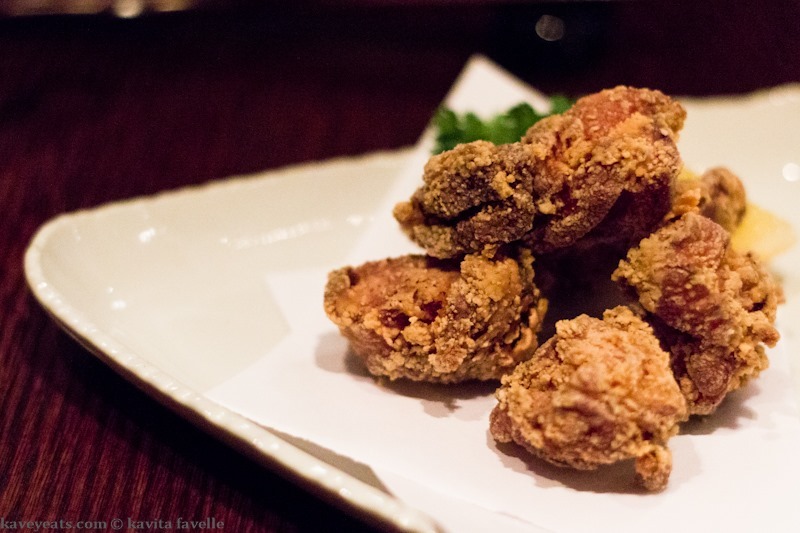 You had me at “pork scratchings with shiitake mayonnaise”. *Swoon*. I love umeshu and this sounds like a fabulous evening!